The You Move Me Bundle is an amazing new product in the Stampin’ Up! Catalogue. We made this card at the recent Stamp-A-Rama event I hold. It is so pretty in person as the butterfly looks like it is flying as you pull the card up. You can see the effect in the video below. 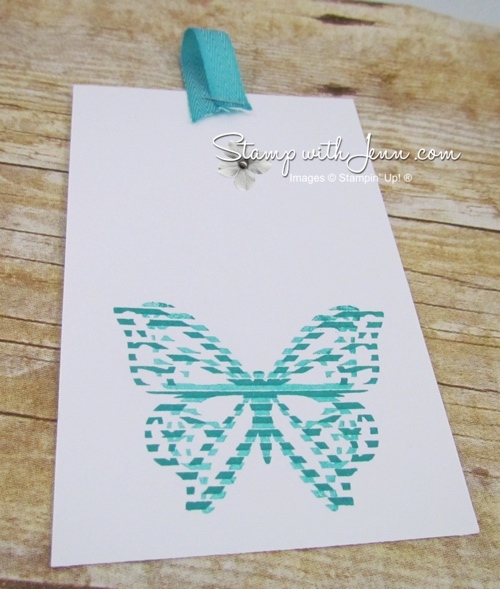 We found that the best way to stamp this butterfly is to stamp the larger butterfly in the stamp set FIRST in darker ink. And then stamp the smaller butterfly, OVER TOP lining up the bodies and stamping just above the line with a lighter colour. On this card, our second colour is just Bermuda Bay stamped on scrap paper first for a lighter colour.